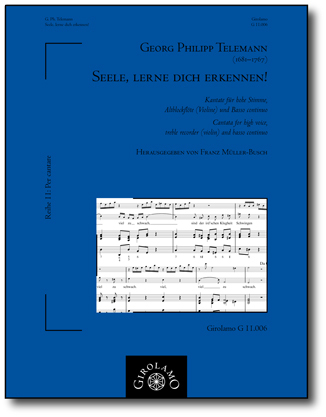 G 11.006 - Telemann: Seele, lerne dich erkennen! The cantata Seele, lerne Dich erkennen! was written for the Sunday Estomihi (earlier Quinquagesimae) – the last sunday before Passiontide. In the TVWV the cantata is recorded under the number 1:1258.1) The text is by Matthäus Arnold Wilkens (1691–1745)2) and refers to the First Epistle of St. Paul to the Corinthians, Chapter 13. The print of 1725 served as a draft for this edition, which is kept in the Royal Library of Copenhagen in the Giedde’s Music Collection under the shelf mark [mu 6208.0586 (XI, 8)3). My special thanks are due to the direction of the music library and in particular to Mrs. Susanne Thorbek for their friendly support and kind permission to print this edition. The notation (including keys and accidentals etc.) has been modernized according to nowadays customary rules. The text has deliberately not been modernized. Additions and corrections made by the editor are indicated directly in the music or in foot notes. In the foreword of his Harmonischer Gottesdienst Telemann elaborates on various aspects of performance practice. The present cantata is written for high voice meaning expressly for soprano or tenor. It is possible that during the ripieno parts which are marked with forte, the recorder is supported by a violin that plays one octave lower than notated. The recorder part can entirely be played by a violin. In this case at least the ripieno parts should be played one octave lower. was der Menschen Witz vermag. viel zu schwach, viel zu schwach. der doch sein Schwachseyn selbst bekennet. steigt das Erkänntnis nicht zu seiner Völligkeit. Learn to know yourself, oh soul! that man’s genius can create. Yet even Solomon acknowledged his human weakness. what was a child becomes a man.